Love seafood, but feel like you can't afford to eat it? Here's how to find cheap seafood at the grocery store, so you don't have to choose between your budget and the way you want to eat. Tuna and halibut are tasty, but pricey. Skip the sticker shock by purchasing cheaper fish that taste similar, but cost a lot less. Try mackerel as a replacement for tuna. Try fluke, flounder, or turbot as a replacement for halibut fillets. Need a good substitute for halibut steaks? Cod or wild striped bass are good options. Like to eat fish more than one night a week? Save big by purchasing your seafood in bulk. Warehouse stores sell big frozen bags of shrimp, tilapia, salmon, clams, catfish, and even lobster. Just pop them in the freezer when you get home, and pull out what you need each week. 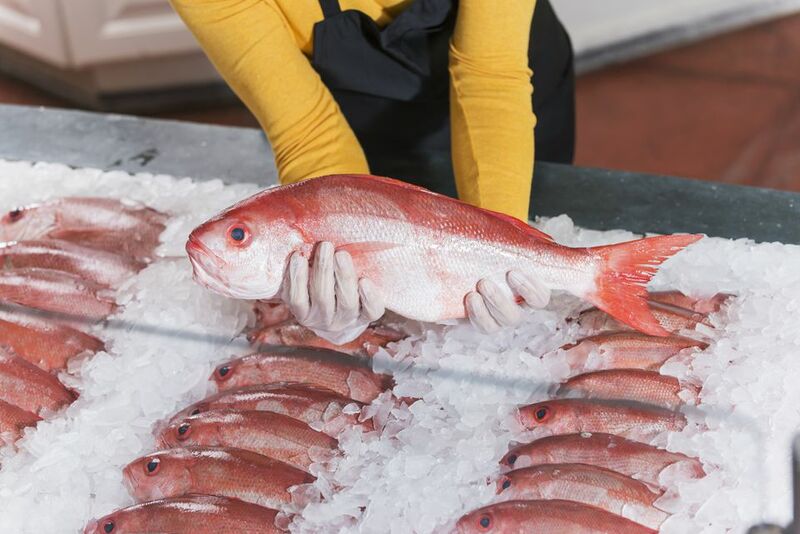 Think fresh seafood is more expensive because it's fresher than frozen? That's not usually the case. Unless you live near the shore, all of that "fresh" seafood was probably frozen when it arrived at the store. And that actually means frozen seafood is the fresher choice. So enjoy the savings, and the knowledge that your fish was frozen shortly after it was caught. A nice bonus to buying frozen: since the fish hasn't already been frozen and thawed once, it can go right back in your freezer until you're ready to use it. Cut your seafood costs by shopping with coupons. Many of the national seafood brands, like Seapak and Gorton's, have coupons you can print from their website, or access when you sign up for their newsletter. For even more coupons, be sure to have the cashier scan your grocery loyalty card every time you shop. Many grocery stores mail (or email) you coupons based on what you buy. So, if seafood is one of the things you buy regularly, you're likely to score seafood coupons—even some you can use at the seafood counter. If the grocery or big-box stores where you shop also have digital coupons on their website, be sure to load any you can use before you head to the store. Watch the weekly sales circulars for deals on your favorite fish. When you find a good price, buy six weeks' worth. That should be enough to get you to the next sale. Have plenty of room in your freezer? Stock up on frozen seafood in March. Since March is National Frozen Foods Month, you'll find lots of great deals. Whole fish cost less per pound, but if you use the fillets and throw away everything else, you'll be paying for things you don't need to. If you're a fillet-only person, stick to buying fillets—that'll be your cheapest option. If you're interested in learning how to utilize the rest of the fish, buy whole. That'll be your biggest source of savings. Wondering what you could possibly do with the head, tail, and bones? Fish stock is a wonderful option, and it's loaded with good-for-you minerals and calcium. But before you get to that, here's how to cook and serve a whole fish. If you treat seafood as an ingredient in the main course, rather than the main course, you can get away with buying a lot less. Serve dishes like clam chowder and lobster mac and cheese, so you'll be able to serve seafood more often. Let your fishmonger know you're looking for ways to save money—he should have a bunch of ideas for you. One great option is to buy salmon tails, instead of salmon fillets. They're half the cost, and still plenty tasty. And if you're interested in making chowder or stews, he likely has other "trim pieces" you can buy at a very reasonable price. No one knows how to make the most of fish quite like someone who works with it every day, so don't hesitate to ask. A good fishmonger will be happy to share his secrets, and probably already has trimmings packaged up for value-seekers like you.